Hey everyone, I hope you all had a great, relaxing Memorial Day weekend. My weekend was great but not so relaxing. My hubby and I spent most of it outside working on the flower bed, and it was so, incredibly, hot outside (the thermometer said 98 degrees, but it had to at least be 150 degrees outside. At least! ), and we aren't even finished yet. Still have more to do next weekend, but the hard work is done and for that I am thankful. Moving on, today I'm going to announce the winners of my Daisy Whitney is awesome contest. 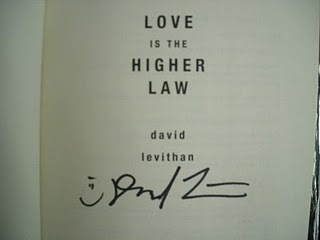 Daisy so generously dontated an autographed copy of Love is the Higher Law by David Levithan and The Mockingbirds bookmarks. (Thanks, Daisy!!!) All winners were chosen by random drawing. Congrats, Jen. I know you will love this book. If you can please email your mailing address to Kimlfranklin@gmail.com, I will mail your prize to you soon!! But wait, there's more. I also have the lovely The Mockingbirds bookmarks to give away. 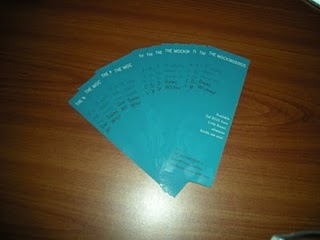 Now, I have a small stack of these to give away, but today, I'm only going to give away 10 of these fabulous bookmarks. I'll save the rest for a different contest. Congrats to all of the winners! If you can please email your mailing address to Kimlfranklin@gmail.com, I will get your prize out to you soon!! I hope you all have a wonderful Tuesday! See you guys on Thursday!!! And don't forget to pre-order your copy of The Mockingbirds by Daisy Whitney today!! OMG I WON SOMETHING?? ME?? THAT IS SO COOL. Congrats to all the other winners too! And also JEN! Awe thanks Kimberly!!! I WON I WON!!! I'm so super excited!!! I can't believe! I will be emailing you shortly with my address!!! Yipee a wonderul way to start my week! You go Jen. COngrats! Also congrats to all the winners. Wahoo and Thanks Kimberly I'll email you shortly. hehe. 98 degrees? Wow! We had snow. We would have loved some heat up here, just not that much heat. Hooray - I won a bookmark! I'm truly always hunting around the house for a bookmark or using an old receipt or sometimes even an (unused) kleenex, so this is perfect! Thanks so much! The gardens must be beautiful ... what did you plant? And congrats to the winners, a fun way to start the week! 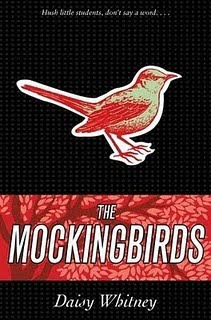 Guess this means I'll go ahead and pre-order Mockingbirds...can't wait to read it! Yeaaaaa, I won, I won. 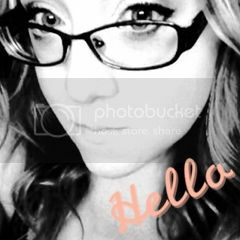 Congrats to the other winners and thanks, Kimberly!!! How about that? I actually need a bookmark. I am using a postit folded over so that the sticky part doesn't stick to everything right now. Thanks! I'll send you my address asap! Yes! This is great, thank you Kimberly! Congrats to all the lucky winners - great prizes Kimberly! Congrats to all the winners. Yay!!!! Wow, so many winners! Congrats to all! Congrats to Jen and the others as well! !